Our nursery program focuses on creating a nurturing and stimulating environment for each child. The caregivers maintain the highest standards in providing individualized care. We will maintain a 1:4 child to staff ratio in the nursery, which exceeds the SC state requirements of 1:5. The 1:4 ratio helps provide the time necessary to have individual quality time including holding each infant through the day, and providing a great deal of individual interaction throughout the day. The caregivers ensure your child is loved and provides for each stage of your infant’s development by encouraging language acquisition, social interaction, and sound physical growth. For your peace of mind, we adhere to strict standards in sanitation throughout the classroom and outside. Our teachers provide a daily report regarding activities of your child including your child’s eating, sleeping, and diaper schedule, as well as activities and other special moments of the day. 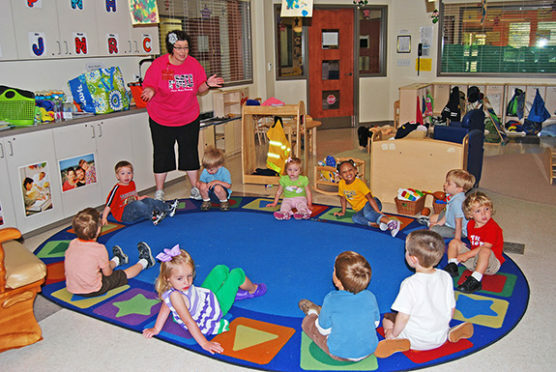 The toddler program focuses on children ages 12 months to 24 months of age, and focuses on creating a nurturing and stimulating environment for each child. Your toddler will feel secure and loved while growing in self confidence and accomplishing the development goals of this age group. Our indoor and outdoor environment is designed with areas of interest, specifically to allow the children to explore and play together as they begin their understanding of socially-appropriate behavior. There is also individual time to focus on fine motor skills, and specific areas of interests of each child. Your toddler will thrive while enjoying creative play and interaction in an environment that builds visual, verbal, and physical development as well as artistic and expressive fun. We build upon the toddler’s natural curiosity and imagination. We focus on colors, sounds, smells, shapes, and textures in the support of their exploration of the world around them. We stimulate language development by reading to the children, and teaching songs that they will love to sing as they develop their language skills. The toddler room has the most current state-of-the-art design. It is designed to ensure your child is never out of sight or out of touch with his/her caregiver. The diaper changing areas are designed so that our caregivers are never facing away from the children. The two-year program focuses on creating a nurturing and stimulating environment for each child, and begins to establish a daily schedule. Planned educational activities and creative play are mixed through the day to help accomplish the developmental goals of this age group. Your inquisitive two-year old will be gently guided in making the transition from individual to group interaction, which is an important step in developing social skills. Through problem-solving activities, your child will begin to link written words to objects. Your child will have fun throughout the day by participating in activities including movement, art, dramatic play, and other activities to stimulate creativity and imagination. The three-year program continues to build on the fundamentals taught in the two-year program. What sets threes apart from toddlers more than anything is their newfound ability to express themselves in words and ideas. We continue to focus on providing a loving and nurturing environment for the children, and ensure they feel secure while they have fun learning their new skills. The school day continues to become more structured, while still giving each child the time to explore and learn individually as well. The small class sizes show the Field of Dreams commitment to providing individual interaction with each child, and to focus on having fun while they continue to develop their skills. The four-year old program prepares the child for the next big step in their education – Kindergarten. Four-year-olds approach the world with great curiosity and use their imaginations to understand it. We encompass a wide variety of planned activities centered on the developmental goals of this age group. Our program and curriculum is committed to providing individual interaction with each child, and to focus on having fun while they continue to develop their skills. In addition to the 11 areas of interest, the educational activities will include math, science and foreign language.. The Gail and Terry Richardson Center for the Child accepts children with special needs as long as a safe, supportive environment can be provided for the child. When a child with special needs’ application for admission to the program is submitted, the Center Childcare Director, a FMU Psychology faculty member, and the parent will meet to review the child’s care requirements. To help the program staff better understand the child’s needs, the parent of a child with special needs will be requested to provide relevant developmental assessment information or arrange to have the child assessed as determined by the RCC Childcare Director and a FMU psychology faculty member. If the RCC Childcare Director and FMU psychology faculty member determine the RCC program is unable to meet the needs of the child, the Director will work with the parent to find a more suitable environment. Parents also may be asked to authorize release of information from providers of special services to help the Center coordinate the child’s care.